The tag <OLDNAME> when used along with the tag <NAME>, allows you to modify NAME's of existing MASTER-records in Tally. Here's a sample Excel sheet which contains StockItem Master-records wherein we have OLD-Names in Column-B and NEW-Names in Column A. The objective is to replace the StockItem Master-records having OLD-Names with the NEW-Names. And here are the XML tags to update / modify the STOCKITEM Master records with the NEW-Names. 1) We have specified two tags viz <NAME> and <OLDNAME> tag. 2) UDI-Magic searches for StockItem MASTER-records in Tally having the OLD-Name, and if found they are replaced with the NEW-Name as specified by the tag <NAME> as shown above. Download the Excel-sheet and XML tags for updating StockItem Masters Names in Tally. Before we proceed with the task-on-hand, let's have a look at what way the UDI-Magic software functions. Open the UDIMagic.ini (configuration file) using Notepad. This file is their in the "c:\udi-magic" folder. Search for heading [UDIMAGIC] and add the option "RedirectXMLTagsToFile=Yes" under it. 1) There may be several other options under the [UDIMAGIC] heading in your INI file. Herein, we have just shown the RedirectXMLTagsToFile=Yes option which is required for Debugging. 3) Always remember to turn off this feature when you finish debugging as this will slow-down the process of uploading the data into Tally. You can use NOTEPAD to view the file xmltags.xml which contains the XML-tags for all the records that are uploaded into Tally. You can now directly view the Excel-sheet templates (formats) for UDI-Magic Software in your browser without downloading / unzipping the zip-files. Here's a sample Excel-sheet template for Stock-Item-Master with Multiple-Price-Levels. 1) Errors occurred while importing MASTERs and VOUCHERs are shown separately. This enables us to easily identify the cause of the error. 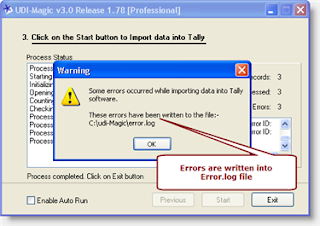 2) Errors are now written in "error.log" apart from being displayed in a "Error-list-box". So if you get any errors while importing data, just go through the "error.log" file in folder "C:\udi-magic" or email the error.log file to support @ rtslink . com (remove spaces) along with your UDIMagic Software Serial Number.